It is not fashionable to hold brief for the Peoples Democratic People (PDP). It is a vocation that is guaranteed a hostile reception by a phalanx of active Nigeria public intelligentsia complemented by the impression that the party itself believes it does not need anybody’s advocacy or does not deserve it or both. It is seemingly perpetually torn between two contradictory tendencies-the arrogance of power undergirded by guilt conscience on one hand and inferiority complex born of intellectual dormancy on the other. Yet I remain a member of the party. One of the lowliest points for me as a party member was the spectacle of the preceding governorship election debate to the Edo state governorship election held on July 14 2012. Three candidates namely Adams Oshiomole of the Action Congress of Nigeria (ACN), Charles Airhiavbere of the PDP and Edebivri of All Nigeria Peoples Party (ANPP) took part in the debate. We can quickly dispense with the third candidate as irrelevant-for him the debate was purely an academic exercise. In terms of pedigree, the PDP candidate was no match for Oshiomole-in what amount, essentially, to an exercise in the gift of garb. If anybody needs to be reminded, Oshiomole was forged in the crucible of the rabble rousing oratory tradition of the labour movement and had acquitted himself as such-as deputy president and president of the Nigeria Labour Congress (NLC), in the past two decades. Arraigned against such overwhelming odds in an unfamiliar turf, Ariahbere would be better served to have contrived an absence from the debate. He did not and neither did he make the best of the bad situation he found himself. As a soldier, nobody can fairly begrudge him of his modest capacity for policy and political articulateness. Hobbled by this limitation, he failed to take a cue from the many generous leading questions he was availed by the sympathetic panelists. He then did conclusive damage to his candidature with two unpardonable errors. First, Oshiomole called his integrity to question in a very direct and brazen manner and he responded with an acquiescent silence and incriminating docility. And then he capped it all by lavishing Oshiomole with an abject, fawning and ingratiating teddy bear hug as a departure gift-as if to thank his tormentor for making an excellent job of cutting him to size. And yet it was all so unnecessary. It was perfectly predictable that he was going to get his nose bloodied in this uneven contest and that was precisely the outcome of the encounter-which then begs the question of what value his attendance was meant to add. This inexplicable strategic error and self delegitimation typically plays to the perception of PDP as sloppy and unthinking. Somewhat bucking this trend was the exhortation to the National Executive Committee, NEC, of the PDP by President Goodluck Jonathan the other day. He said: “It is our duty to continue to resist and tell Nigerians the correct things we are doing and we believe that if we do not have a party as robust as the PDP, probably the present republic would have collapsed, because we witnessed what happened in the First Republic”. The President made the point that the nationally inclusive and unifying quality of the Party, is what sustains the unity and stability of Nigeria. It is a thoughtful and weighty statement and within its expansiveness lies a core of truth and potential. Let us put the proposition to the test of contemporary political history and the durability of the fourth republic. The PDP started not as political party but as a national rally and it was called the G34. The G34 was the culmination of the struggle for national political reclamation against the destructive course of history set for Nigeria by the late General Sani Abacha. The passage of Abacha, the urgency of military disengagement and the transition to civil democratic rule agenda of the General Abdusalami Abubakar administration dictated the transformation of the G34 to a political party. It presented itself and was recognized as the most viable and inclusive vehicle for birthing the Fourth Republic. After the interlocking death of Abacha and Chief Moshood Abiola, the primary duty and responsibility before the corrective regime of Abdusalami Abubakar was the overlapping task of national reconciliation and restoration of civil democratic rule. The task was essentially predicated on the strategy of compensating the South-west through an implicit concession of the Presidency of Nigeria to the zone. In recognition of its national and inclusive potency, the political leadership of the South-west had originally identified the PDP as the rough and ready platform for the realization of this objective. Hence the membership of the late Chief Bola Ige and Chief Olu Falae in the early days of the PDP. Political brinkmanship within the South-west leadership ultimately resulted in the formation of the Alliance for Democracy (AD), as their final destination. 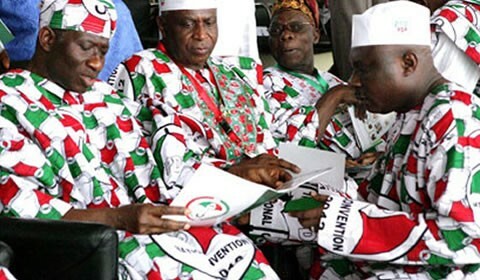 Of the three political parties that were registered, the PDP, in its completeness, was more than the sum of the other two parties put together. Indeed the All Peoples Party (APP) and AD, and their latter day derivatives, were little more than ethnic and regional standard deviations from the golden national mean of the PDP. The APP did not win any election outside of the moslem North and the AD equally did not win election outside of the South West. The PDP won across all the divides. The undisputed quality of Chief Olusegun Obasanjo is his towering Nigerian nationalism and he became a perfect fit for the PDP and Nigeria in the search for the best candidate of South-west origin to advance the prior agenda of national reconciliation. As President and Yoruba, he and the PDP became a bulwark against the residual Yoruba alienation and irredentism of the AD. As President and Nigerian nationalist, he and the PDP successfully tamed the ethno- regional truculence of the APP and the allied Sharia casus belli of the Islamic North. In these two regional instances of challenge to the unity and stability of Nigeria, how would the nation have fared without the stabilizing instrumentality of the PDP?. In the run up to the 2003 general election I did not anticipate and I know nobody who anticipated that the PDP would sweep the South-west. This needs to be said for the benefit of those inclined to attribute the victory of the party to a preconceived electoral foul play. There is no logic to the notion that any rigging conspirator, no matter how crooked, will aim to rig and supplant another party in five of six states, controlled by that party, in one fell swoop! The result came to all PDP stakeholders including President Obasanjo-who did not hope for victory in more than one state, as a pleasant surprise. I was in Ekiti state for the election and I can say with undiminished truthfulness that the election there was won and lost fairly and squarely. Even after making allowance for electoral malpractices-which cuts across all the political parties, the PDP victory was rooted in the principle and reality of substantial compliance. Those not familiar with the political configuration of Nigeria could be forgiven for assuming that Nigeria is a one party state when the former American ambassador to Nigeria, John Campbell wrote his ‘Dancing on the Precipice’ commentary in the antecedence to the Presidential election of 2011. In his peculiar passion to draw attention to a potential source of destabilizing crisis for Nigeria, Campbell was more catholic than the Pope and royalist than the King. Yet the point he sought to make holds validity and was actually a back handed compliment and recognition of the PDP as the personification of Nigeria. In its mission to force the issue of zoning the Presidential candidature of the PDP to the Northern half of Nigeria, the Northern Consensus Forum was equally operating in tandem with the American diplomat. And there is no running away from the fact that the inadvertent breach of the zoning principle posed and still poses a dilemma for the PDP and Nigeria. This was the point the former National Security Adviser, General Owoye Azazi-at the height of professional indiscretion, laboured to make and ended with the muddle of gifting the Nigeria media the attention catching headline that screams ‘PDP is the problem of Nigeria! No intervention could have better served the propaganda purposes of the opponents of PDP. But what does this particular test case say of the political utility of the PDP? First it says that when the PDP sneezes, the whole of Nigeria catches cold. In other words, whatever happens within the Party, for good and bad, has immediate and long term consequences for the well being of Nigeria. Second, it reflects well on the crisis management capacity of the PDP that the Northern consensus candidate, Vice President Atiku Abubakar chose to remain in the party to pursue the realization of his Presidential ambition. Third, the Party is, by far, the most realistic platform for seeking the ultimate political prize of winning the Nigerian Presidency, hence its ability to retain the membership of disaffected political office aspirants. The downside of the PDP is no less conspicuous. Now and again, it exhibits the self destructive streak of being at war with itself. Elected Party members routinely and maliciously gang up with non Party members to undermine and subvert Party positions and other PDP members holding public office. The present Speaker of the House of Representatives, for instance, assumed that position in defiance of his party and in active connivance with opponents. More importantly, it is difficult to look at Nigeria today with any measure of satisfaction at how far we have gone on the ladder of development in relation to the enormous potentials of the country. If the PDP is the clear dominant political player, then it will have to take commensurate responsibility for the failings of Nigeria. If it desires that Nigerians share the sentiments of President Jonathan on the positive perception of the PDP, the Party will have to challenge itself to go beyond the accomplishment of the irreducible minimum of keeping Nigeria together and take Nigeria to the higher ground of transparency and accountability in government; bridging the infrastructural gap that has widened and deepened to a chasm; respond effectively to the grinding poverty afflicting the majority of Nigerians…….the wish list is necessarily long, too long. As the scripture says, the harvest is plenty but the labourers are few.